Bo and his son, Trent, got to do a little fly fishing together yesterday on the Little Red River. 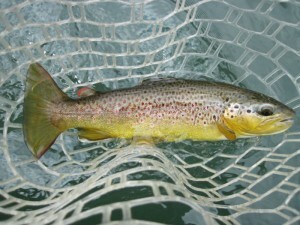 The COE had been generating at the level of about 2400CFS for about twelve hours so the water level had been stable for quite a while and the Brown Trout obviously liked that situation. Last fall while fly fishing on the Missouri River in Craig, Montana we learned about a variation of the old standard San Juan Worm that Bo has nicknamed the “Big Mo Worm.” The set up yesterday was a 5wt. rod, 5X tippet with a #8 Big Mo and a #14 Born’s Hairy Legged Sowbug as a dropper. 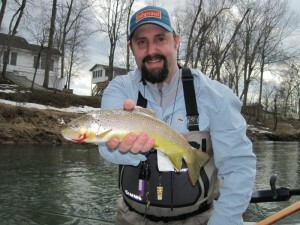 This rig gets deep quickly and the guys caught about equal numbers of trout on both flys. Beginning tomorrow 3-1-14, the COE is scheduled to shut down the power plant a Greers Ferry Dam. The plan is to run 300-500CFS around the clock until 4-24-14, assuming nor significant rainfall. With this level of stable water levels we should see some amazing fly fishing and hopefully some amazing March Brown and Caddis hatches making for hopefully epic dry fly fishing. There should be good wading opportunities and I bet we will be in the drift boat most days. If you want a shot a some excellent dry fishing just give us a call and book your trip with Empty Creel Fly Fishing Guides and Outfitter.